This product requires the base game Anno 2070. Buy all Financial Crisis DLCs in one package. Get access to the alternative Tycoon Statistic Center, the Mission Package "Crisis Response" adding 2 challenging Missions and the "Distrust Series" Pack, consisting of several new ornamental buildings to customize the look of your city. "Central Statistical" Package - Get direct access to the statistic center without fulfilling the world event upfront. You'd like to dress your brand new tool with an exclusive skin? The "Central Statistical" Package provides you with a glamorous look for this economy building. 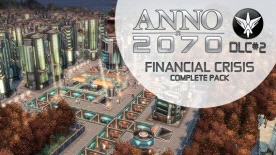 Anno 2070 is required to play this DLC.